Hire Lili Wexu for your commerical, narration or voicemail today! To hire Lili Wexu and to get access to the 2019 voice over rates, she will need to know who the client/product is (to assess potential exclusivity conflicts), where the production will be used, and for how long. If the voice over rates are in line with your budget, you may schedule a recording session by booking an available time on her calendar, below. If you trust Lili to record your project on her own from her professional home studio (iso-booth) in Los Angeles, CA, you do not need to book a time slot. Once you hire her, she will simply record between scheduled time slots. You may however browse her calendar to get an idea of her availabilities here. When you hire Lili, you always have the option of calling her in the recording studio to monitor or direct her while she records your narrations. For short narrations under 3 minutes, booking a 30 minute slot is usually sufficient. For commercials, or if you simply prefer more time to record, feel free to schedule a one hour slot. 4 hour Source Connect session. 4 hour local LA studio. 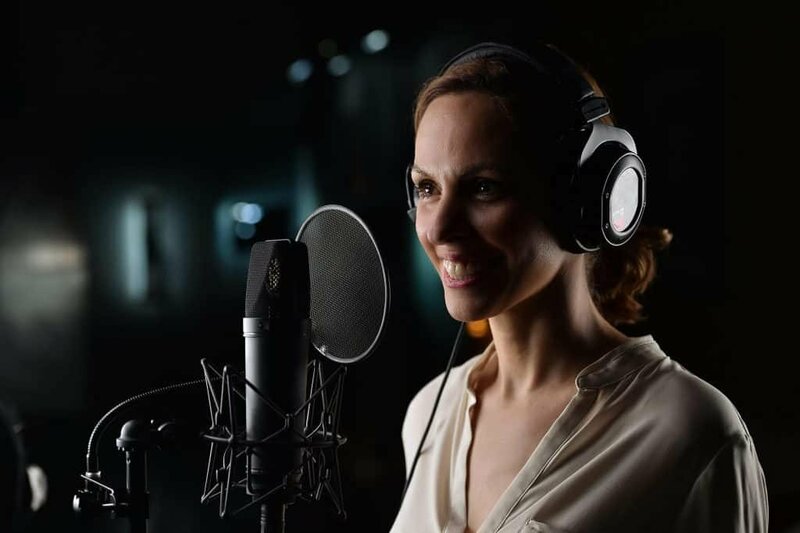 If you hire Lili to record your voiceover narrations from her professional voiceover iso-booth studio, she will deliver your files via a file transfer service like Hightail as soon as she has finished editing your files. Turnaround may take from 30 minutes to 6 hours after a scheduled recording, depending on the length of the narration. Please give yourself some leeway in the event a narration is taking longer to edit. Bumps on the road may occur and we should all schedule some breathing room for unforeseen circumstances (think power outages, helicopters landing on her roof, etc.) We are kidding about the helicopter, but loud continuous noises can halt production from time to time (rarely, but not impossible). If your recording is handled by a commercial studio, they will provide you with the edited files. Payments are processed via a secure credit card invoicing system (Quickbooks), upon delivery of files. Deposits are required for new clients. Major credit cards accepted (Visa & MC). -No checks or 30, 60, 90 day terms accepted at the moment. Hiring female voice actress Lili Wexu and getting your voice over recorded is easy. Look at the column on the right to learn about the various steps in the process of working with Lili. Ready to hire Lili and record that voice over? Order .wav, .aif and .mp3 female voice overs today! Here are the steps you will take to hire Lili and get voice over rates. Soon, you will have to decide which way to record your voice over narration, commercial or voicemail. The hiring process is an easy one that can unfold rather quickly, especially if your script is final and ready to be recorded. Most often, you’ll request a custom demo (audition) of your script, and/or quote. Custom demos are free of charge. If you are requesting a demo of your scripts, please give me direction on tone, pacing and accent. If you’ve requested a custom demo, I will record a portion of your script and email it to you, along with the 2019 voice over rates. Please pay special attention to the various sections on the rate sheet, as well as the usage. Below the voice over rate sheet, you will find a complete list of Guidelines. Please read them carefully, as they contain information about turnaround times, ways to figure out rates, the policy on revisions, etc. Being aware of the guidelines creates a smooth workflow and helps to handle any bumps on the road! The final version of your script (this is important to avoid unnecessary re-records). Your script should clearly indicate the way you would like me to separate and label the various sections of your scripts (with file names). Any notes or directions you’d like me to keep in mind before I start recording. At this point, let me know the file format you prefer, such as .mp3, .wav or .aiff. NEW CLIENTS: I require a 50% deposit before scheduling or processing orders. The balance is requested upon delivery of audio files. ALL CLIENTS: If you have a PO number you would like me to add to my invoice, please provide it at the same time you send me your final scripts. This will avoid recording delays and extensive email communications. I record and edit on my own. I can show up at a local Los Angeles studio of your choice. Again, this option is costlier since you will pay for the commercial studio on your end. To book a recording time with me, click on a time slot below. Note that you do not need to book a time slot if you are not calling into my studio for the session since I will record during free time slots. If you want to check my general availabilities, do so here. If I have recorded the project from my home studio, I will edit the sound files (remove any mistakes, attenuate breaths where necessary, remove noises, etc.) and label files according to the instructions in your script. This editing process may take up to two or three times as long as the recording process itself. If you have hired a commercial studio to handle the recording, that studio will provide you with the edited files. Once the files are edited, I will email you an invoice (featuring any PO# you have provided), along with a W9 form if requested. The invoice will include a link to your audio files via hightail.com. This will make it easy for you to download large files to your computer quickly, and review my work. I accept payments online by credit card, via the secure accounting system I use for invoicing (Quickbooks in the United States, and e-transfer or direct deposit in Canada). No checks or terms are accepted. Payments are requested upon delivery of audio files. No terms accepted (30, 60, 90 days). NEW CLIENTS: I require a 50% deposit before scheduling or processing orders for new clients. The balance is requested upon delivery of audio files. The 2019 rate sheet generally includes a free minor round of revisions for small changes you might like to make after the initial recording is complete, within 10 business days from the date of delivery – perhaps altering the way a word is pronounced or emphasized, or making a small change to a sentence or two. For extensive changes, and particularly if you decide to rewrite the script or make substantial additions, there are additional fees. The Guidelines below the rate sheet indicate how more extensive revisions are handled.